I actually quite enjoyed choosing what I wanted from the catalogue. I also bought the products on offer rather than full priced items – I’m sure that’s what most of you do. So far, so good. I absolutely love the Plum blush! And the gloss is also very long-lasting – full reviews to follow. I’m curious about the accent mascara, which I can’t test yet thanks to a gross dose of conjunctivitis. They come in different shades for each eye colour. Avon have put together anti-ageing kits which claim to rejuvinate your skin in two weeks. I got my hands on the Anew Rejuvenate Kit – Skin Revitalising 14 Day System. This kit is aimed at those in their thirties, Ok so I’m a few years shy of the thirty mark but they don’t sell one for twenty somethings. I’ve decided to give this kit a go in aid of prevention :) There are different kits for those in their 30’s, 40’s , 50’s and 60’s. They sell the kits for €10 and the contents are worth €42. It’s a great way to try test the products without committing to full size pots. It would be ideal for a holiday since you would have everything you need for the fortnight. I’ll reluctantly give up my Lancome Renergie Yeux for two weeks (friggin’ amazing!). I will start my testing today and get back to you after the two weeks are up. Have you tried any of Avon’s skin care products? I have been trying out Avon Anew Age Transforming Compact Makeup SPF15, wow what a mouthful. I have a bit of a love hate relationship with Avon products. This one was a gift from my aunt last year. It has stayed in the bottom of my makeup drawer but last week I decided it was time to give it some life. This is a silicone based compact foundation. I generally don’t like compact foundations but I tried to be as unbiased as possible. One great things about this product is that it offers protection from UVA rays thanks to Titanium Dioxide. The downside to this ingredient is of course that it can look a little pasty when exposed to flash photography. Right away that makes this a no no for a bride. It feels quite greasy when first applied but it’s smooth and easy to blend. It sets to a satin finish, no grease. It’s a little powdery to the touch but didn’t actually look powdery on the skin. It provided a light coverage which didn’t last very long on my normal to combination skin.I tried a little on an older client to see if the foundation seeped into wrinkles and pores. It didn’t thanks to the silicone. This product also contains a retinol blend. I wouldn’t get too excited about this, the levels are more than likely ridiculously low (to avoid skin reactions in customers) and even at that the tiny dose of retinol could be affected by it’s exposure to light and oxygen. This foundation would be a good option if you..
For me, I’m afraid it’s a thumbs down. In fact every Avon foundation I have tried, admittedly a few years ago, left me disappointed. What are your thoughts on Avon foundations and their make-up in general? If you have seen my Spring Favourites video you know that I am currently addicted to shine sprays. This is thanks to my red/brown hair (who knows what colour it is anymore!) Being a natural blonde, shine sprays did squat for me since blonde hair absorbs light. Now with darker hair I have the luxory of light reflection. Man I cannot get enough of the shine! 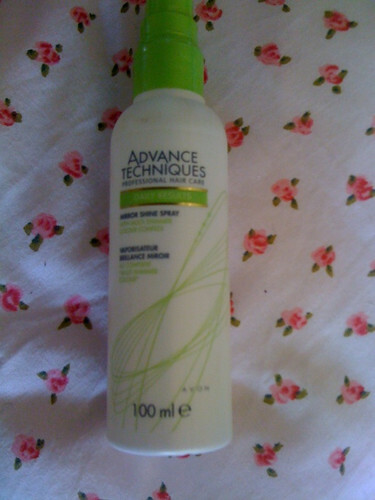 I have bought plenty of shine sprays but there is one that has captured my heart, Advanced Techniques Mirror Shine Spray from Avon. It doesn’t make my hair greasy, it doesn’t darken it and best of all it doesn’t leave it flat. Most shine sprays I have used before make volume impossible but not this one. I let my hair dry naturally and them before I style it I spray two pumps with my arm outstretched. That way a light film of the product coats my hair. I’m afraid to try anymore than this, fearing that if I apply too much there’ll be no saving it. It has a fresh apple sort of scent, like most of Avon’s haircare.It also takes down ant frizz or flyaways. I bought this spray as part of a 3 hair care products for €7.50 deal a few months ago. Absolute bargain! I will definitely be repurchasing. What are your thoughts on shine sprays? Have you a favourite? What is your favourite tanning product?